One of the major difference between the photodiode and the phototransistor is that the photodiode uses PN-junction diode which converts the light energy into an electric current, whereas the phototransistor uses the ordinary transistor (NPN transistor) for the conversion of light into current. Some other differences between the photodiode and phototransistor are shown in the comparison chart. Both the photodiode and phototransistor work on the principle of the inner photoelectric effect. The photodiode uses ordinary PN junction diode which has two terminals namely cathode and anode. And in phototransistor, the normal transistor is used. The only difference between the transistor and the phototransistor is that the phototransistor does not have the base terminal. The base side of the phototransistor captures the light from the source. Uses For generating solar power, for detecting ultraviolet or infrared rays, for measuring light etc. Smoke detector, compact disc players, invisible light receiver, in laser etc. The photodiode is a type of semiconductor diode which converts the light into the electric current. This type of diode is also called photo-detector or light sensor. It works on both the reversed and forward biasing. The small leakage current flows in the reversed direction, even when no light incident on it. The current constitutes in the diode are directly proportional to the intensity of light absorb it. The photodiode is used in switching circuit, and in electronics devices like a smoke detector, compact disc players, in light meter, etc. The circuit diagram of the photodiode is shown in the figure below. The arrow shows the positive terminal of the photodiode and the base shows the negative terminal of the diode. The working of the photodiode depends on the intensity of light strike on it. The light incident on the diode reduces the width of their depletion region, and hence the electrons and hole starts moving across the region. 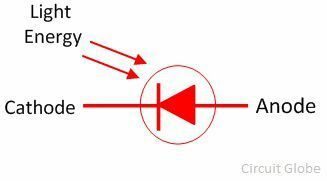 The electron moves towards the cathode, and the hole moves toward the anode. Because of this movement’s current is induced in it. The phototransistor is a two or three terminal semiconductor device which converts the light energy into an electric current or voltage. It is a special designs transistor which has a light-sensitive base region. When the light incident at the base of an NPN transistor the base current develops. The magnitude of current depends on the intensity of the light incident on it. 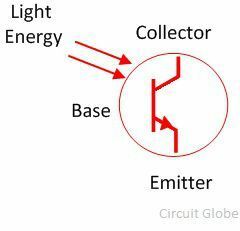 The phototransistor amplifies the input light, and the output current is obtained from the collector of the transistor. The circuit symbol of the photo-transistor is shown in the figure below. The arrow shows the light energy incident on their base surface. The photo-transistor is enclosed inside the opaque container so that the light particles or photons are easily reached on their surface. The collector region of the phototransistor is large as compared to the ordinary transistor because it is made up of heavy diffuse semiconductor material. When the base of the phototransistor absorbs light, they release the electron-hole pairs. Because of this hole pair, the depletion layer of the diode decreases and electron starts moving from the emitter to the collector region. 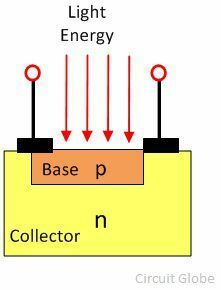 For the small amount of light energy, the transistor amplifies the large collector current. The photodiode is a semiconductor device which converts the light’s energy into an electrical current. Whereas, the phototransistor uses the transistor for the conversion of light energy into an electrical current. The phototransistor generates current whereas the photodiode produces both the voltage and current. The response of the photodiode is much faster than the phototransistor. The photodiode is less sensitive as compared to the phototransistor because the phototransistor produces the large output current. 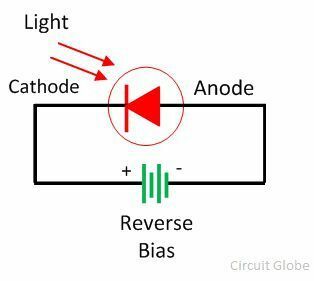 The photodiode works in both the forward as well as reversed biased whereas the phototransistor work in forward biasing.The emitter of the phototransistor is negative as compared to the collector region. The photodiode is used in solar power plant, in a light meter, etc. whereas the phototransistor is used for detecting the light. The photodiode and photodiode both convert the light energy into electrical energy. But phototransistor is more sensitive as compared to photodiode because of the use of the transistor. The transistor amplifies the base current which causes because of the absorption of light and hence the large output current is obtained through the collector terminal.The time response of the photodiode is much faster than the phototransistor, and hence it is used in the circuit where fluctuation occurs.